So, I know that Mother's Day was a few weeks ago, but I've been so busy, that I'm just getting to reflecting on it. We had a great day visiting my Mother-in-law, and my Mom. Breakfast in bed, gifts from the kids, a new coffee table from Adam, and a phone call from Elder Kempler, all made it a great day! My smallest, and most favorite gift was from Stephen. 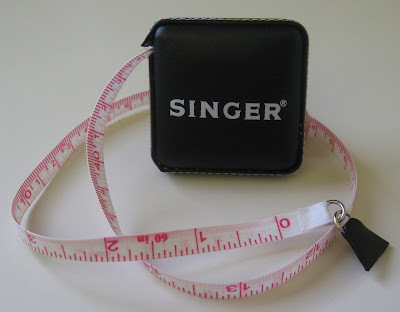 My new Singer retractable measuring tape! With me at all times in my purse from now on. Side note: It's really effective to tell everyone where exactly, on the notions wall at Jo-Ann's, your gift is hanging, and hand them a 40% off coupon! Oooo, I'm going to have to get one of those! My current tape measure usually ends up as someone's lasso.